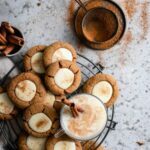 Eggnog Gingerbread Thumbprint Cookies made with molasses, maple syrup, eggnog, and white chocolate. Perfect holiday cookie recipe! In a large bowl sift your flour and hand whisk in baking soda, spices, and salt. Set aside. In bowl of stand mixer, (or large bowl with hand mixer) beat together softened butter with brown sugar until creamy. Add flour mixture a third at a time, making sure its well mixed before adding the next third. Measure 1 Tbsp or 1.5 Tbsp of cookie dough, using a spoon or small ice cream scoop. Roll cookie dough into small balls with your hands. Place each cookie dough ball into a bowl with the granulated sugar, roll around for a light coating. Next, place dough balls 2 inches apart on cookie sheet. Bake cookies for 6-7 minutes until almost cooked. These were perfect at exactly 7 minutes for me. Don't bake cookies until they are hard. Bring them out of the oven while still slightly soft. They will firm as they cool. Once out of the oven, take your teaspoon and gently press down your 'thumbprint' again. Don't go lower than halfway through cookie. Transfer eggnog white chocolate to a piping bag. Pipe into thumbprint of cooled cookies. Set cookies in the fridge for chocolate to set. Store cookies in an air tight container at room temperature or in the fridge.